Hundreds of CASA volunteers fill the North Atrium of the State House during CASA Day. 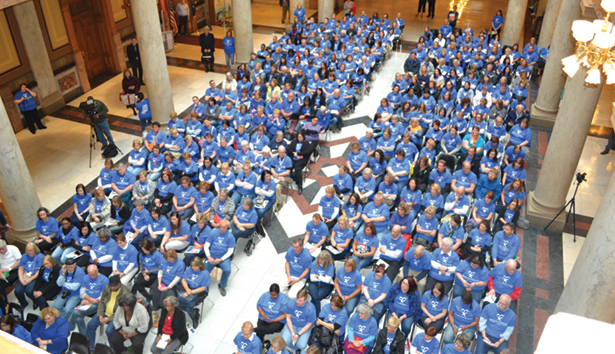 A sea of about 350 volunteers in matching blue shirts filled the North Atrium of the State House on March 7, for CASA Day, an annual rally that connects CASA volunteers with lawmakers. Governor Mike Pence and Chief Justice Loretta Rush made remarks to an impassioned crowd, and thanked the volunteers for their work on behalf of abused and neglected children. CASA (Court Appointed Special Advocates) volunteers advocate on behalf of abused and neglected children whose families are involved with the child welfare system. There are 3,470 CASA volunteers in 78 Indiana counties advocating on behalf of 23,524 children. The volunteers thanked lawmakers for the recent funding increase for GAL/CASA programs and shared information about how the programs are working to recruit more volunteers. Chief Justice Rush speaks to the crowd at CASA Day 2016. 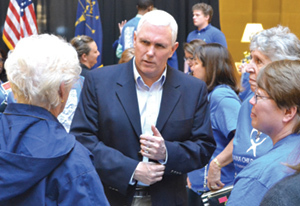 Governor Mike Pence meets with volunteers at CASA Day at the State House. In 2015, the Indiana legislature increased the appropriation for state GAL/CASA programs by $2.1 million. A portion of the new funding went to the implementation of Optima, a case management system that helped State Office and county level GAL/CASA programs track children in the system and child outcomes. All Indiana counties with GAL/CASA programs will have access to Optima by the end of 2016. $1.5 million was also distributed by the State Office of GAL/CASA to 66 counties across the state to assist in advocating for more children. State GAL/CASA Director Leslie Dunn began the event by speaking to the volunteers, sharing statistics and accomplishments from the previous year. 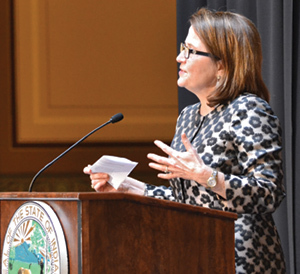 Dunn noted that Indiana’s CASA programs are uniquely successful because they have strong support from all three branches of government in Indiana. Indiana has one of the largest networks of CASA programs in the nation and serves more children than almost any other state. The event offered a chance to raise awareness about the work done by CASA volunteers. There was a 30% increase in CHINS cases in 2015, and CASA advocates stepped up to assist by advocating for 26% more children than in 2014 and by donating over 338,000 hours of their time. The volunteer hours were noted by Chief Justice Rush, who spoke about her experiences with children in the courtroom during her time as a trial court judge. Governor Pence was introduced by one of the foster youth. The Governor brought a special guest, his mother, Nancy Pence-Fritsch, who advocated for children during her time as a CASA volunteer in Columbus several years ago. The highlight of the rally came with impressive presentations from two foster youth. Each told inspiring stories of how their CASA made a difference in their lives. One of the foster youth has finally found a voice and is empowered to stand up for what he wants to happen in his life. Another former foster youth is attending college after receiving support and encouragement from his volunteer. The rally was sponsored by the Indiana State Office of GAL/CASA of the Indiana Supreme Court, Division of State Court Administration. If you want more information on becoming a CASA volunteer or starting a CASA program, contact State Director Leslie Dunn at leslie.dunn@courts.in.gov.